So please forgive me for it being pretty quiet around here, and trust that it’ll all be back to normal very, very soon. I’ll have pictures to share of the most amazing yoga event I’ve ever been to, where 300+ people practiced together, plus more recipes and tips on how to transition to being hippie-ish! Speaking of being hippie-ish, let me start there. There has been a big trend in the last few years to return to doing things more naturally. Less chemicals, less processes, less gross stuff that’ll give you cancer! I eat paleo-ish and try to use chemical-free products when I can, but I’ve long been a girl who likes to do things naturally. It might have started when I lived in Berkeley, which is the hippietown USA! As I mentioned in Small Life, Slow Life: A Kick of Creativity, I’ve had some stomach issues this year. 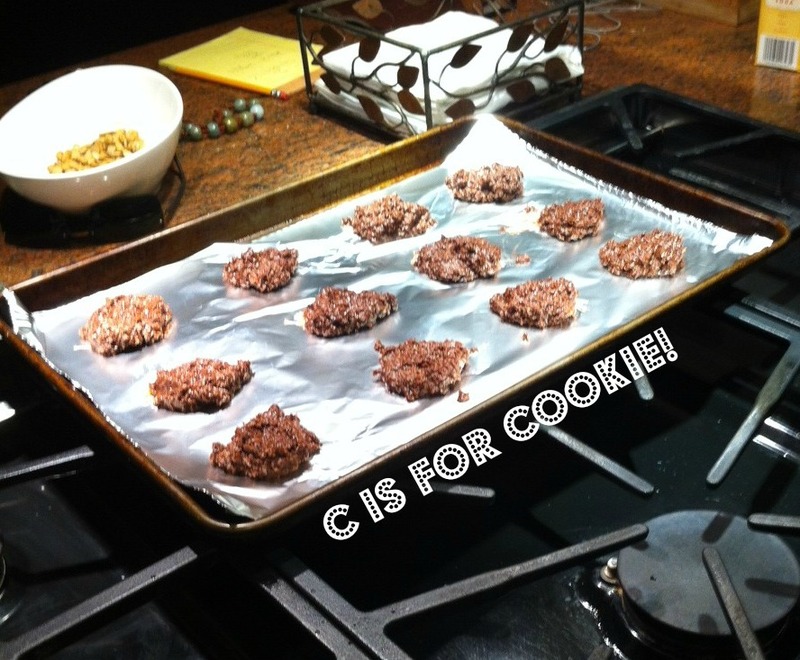 Forget about tums or acid-blockers or anything else that would further worsen my digestion in the long run! I wanted to do it the old school way and have been looking into making my own fermented food. Fermented food is fantastic for repopulating the gut with good bacteria and edging out the parasitic bad guys that get to your nutrients before you do as well as giving you a ton of tummy trouble. I drink kombucha daily and it alone has saved my stomach! Well folks, I decided a few weeks ago to give making raw sauerkraut a shot. In case you want to try this insane kitchen science project, the sauerkraut recipe called for one head of cabbage, two large carrots, one jalapeno and four cloves of garlic. You’ll also need two 32-ounce mason jars and one very large mixing bowl. Start by removing the large leaves on the head of cabbage and setting them aside. 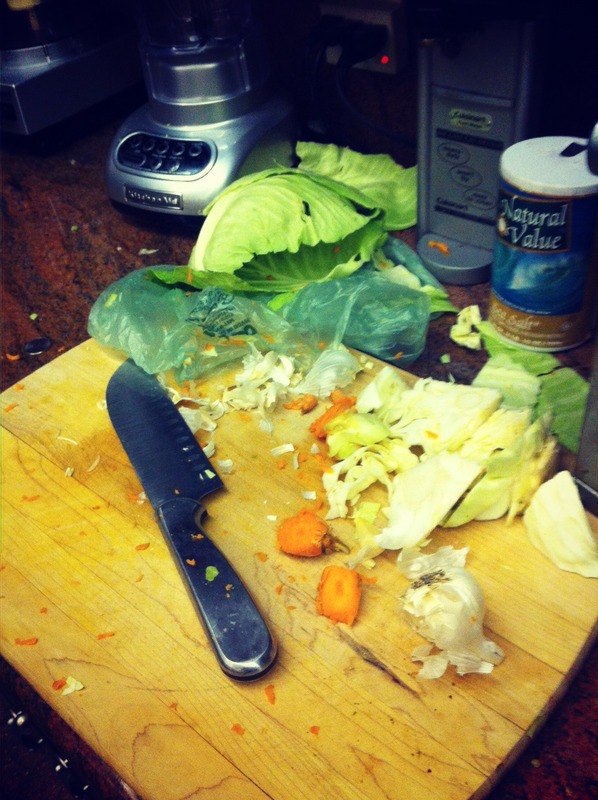 Then cut the cabbage into thin strips and set the strips into three equal piles. Once you’ve done that, you take one pile at a time, put it in your large bowl and add about a tablespoon of salt. You then squeeze and work the salt into the cabbage until liquid begins to seep out of the strips. It’s hard work but you’ll know when you’ve done it right – it gets very watery. Note – this is not for the weak-armed. My arms were sore after doing this! Set aside your bigger cabbage leaves – you’ll need them later. Repeat this process until all your cabbage is in the bowl – nice and liquid-y. Then add shredded (I grated mine) carrots, chopped garlic, a bit of black pepper and the chopped insides of a roasted jalapeno (I just roasted it on the stove top super quick). You certainly don’t have to add any other vegetables besides cabbage if you don’t want to! Then split this mixture into your two mason jars. 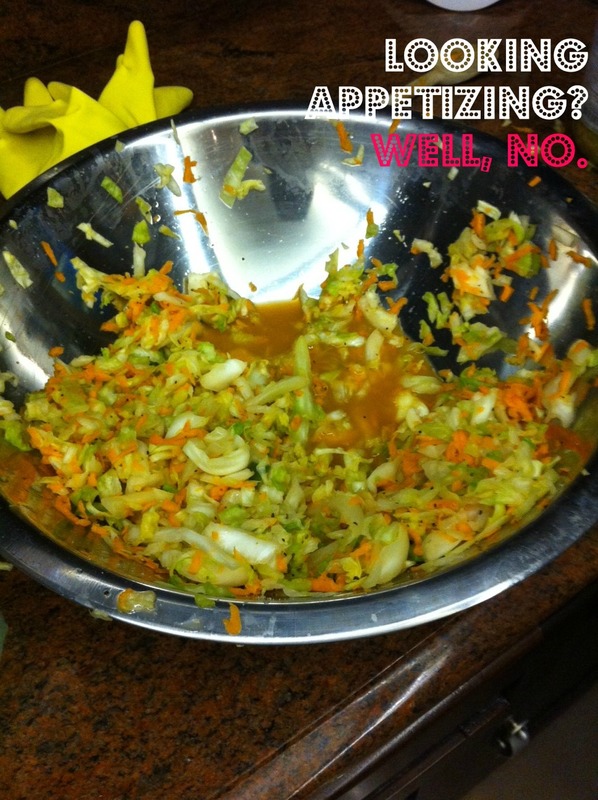 There should be enough liquid from the cabbage to cover the whole mixture by about an inch or so. If not, add a little water until there is. Then take your cabbage leaves you set aside and smoosh (yep, smoosh) them on top of the whole mixture, sealing off the chopped veggies from the air. It took me a while to do this, and I, in a silly fashion, did not use mason jars but glass containers we’d gotten yogurt in. If I were you, I’d use the mason jar because the mouth is wider which comes in handy later. If the veggies are floating to the top or it’s hard to hold the cabbage down, you can add a weight to the top of the mixture. The fermentation process happens underwater, and for the sake of anti-mold stuff, you really don’t want any part of this touching the air. Per Diane’s recommendation, I placed a water-filled shot glass on top of each mixture and it seemed to do the trick. Cover the top with a paper towel or piece of cheese cloth. You can rubber-band it around the mouth of the jar or use the metal screwtop to hold it in place. Put your jars in a dark place they won’t be disturbed. Check them every few days and in two weeks’ time, they’ll be ready! 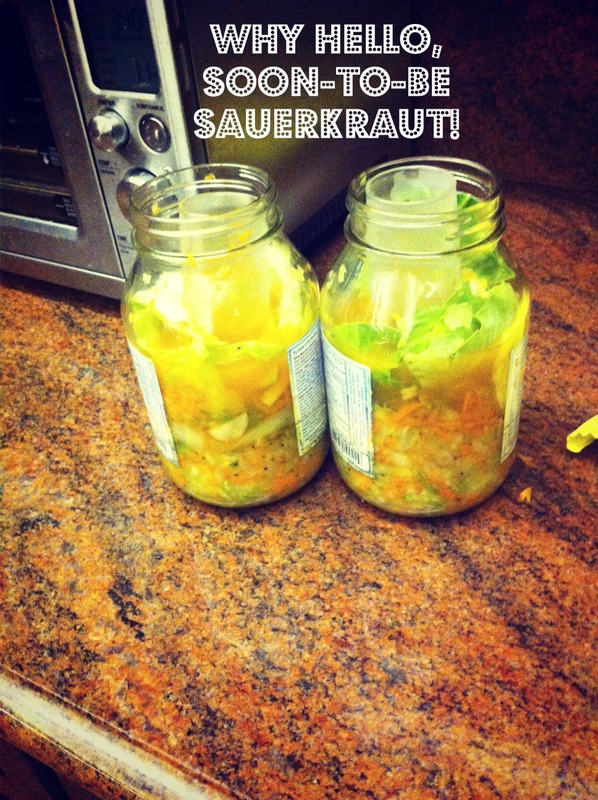 Where I went wrong: The jars, as I mentioned. It’s totally natural for a thin layer of mold (eek) to form at the top of the water. If this happens, just take a clean spoon and scoop it out. But because the mouths of my jars are so small, it’s really hard to get my spoon in there. One jar didn’t grow any mold at all, but in the other one, my cabbage leaf had curled up out of the water and was covered with fuzz. (Barfy!) I’m nervous about it, so that batch probably isn’t going to make it into my mouth. Luckily, my other mixture is fine. I have mason jars now, so the next time I do this, it’ll be the right way. I’m really excited to give my batch a taste (even though I’m not a huge sauerkraut fan…hmm) and I know it’ll be good for my digestion. Kombucha is next on the list – I hope to make it next week when things have slowed down a little! In my next post on being slightly hippie-ish, I’ll tell you about the time I stopped using shampoo and conditioner. Permanently. Ooh! I think I’ll look for that book Practical Paleo. SOunds like it could be of use. Good to know. I’ll check it out.